Dutch Iris Bulbs : Varieties for sale, Planting and Care. If you are looking for an bulb for mass planting, then Dutch Iris could be it. They grow well with other spring flowering bulbs and can be used to break up patches of daffodils. Easy to care for, colorful and no need to dig, Dutch Iris (Iris x hollandica or Iris xiphium) are a true bulb. With very attractive purple and yellow flowers this easy care iris is winner in any sunny garden. Tall growing and somewhat ‘stately’, try planting them in clumps in the garden border for a great display. And yes you can grow them in pots and containers, Dutch Iris will reach a height of around 70cm. 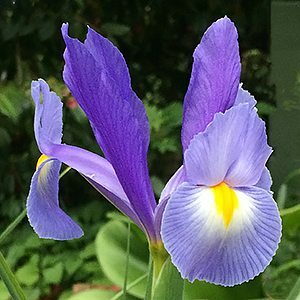 Available for sale and planting from late summer to autumn as dormant bulbs, Dutch Iris are widely used in the garden and as a cut flower. In Australia Dutch iris grow well in the cool to temperate zones, however they struggle in the sub tropics. Planting time is Late Summer to early spring (Feb – June) for flowering in spring. With a stem length of up to 70cm they are used widely as a cut flower. named cultivars such as ‘Saphire Beauty’, ‘Apollo’, ‘blue magic’ and’ purple sensation’ are readily available from online suppliers. Easy to grow and care for, Dutch iris will reach 40 – 80cm in height and make a great display and are a favourite cut flower. They prefer a well drained, humus rich soil and plenty of sun. Coming in yellow, white, pale blue and the well know deep purple-blue, flowering in late spring they make a great display in the garden or in a pot. They are a true bulb and growing them is fairly simple. Aphids can be a problem as can snails, take normal precautions for these. Try digging in some well rotted compost and cow manure a few weeks before planting. Plant bulbs 8 – 10cm deep make sue the pointy end is up. You should not need to water again until signs of new growth appears. Once new growth appears water twice a week unless you have rain through spring and early summer. Remember, full sun to part shade. Fertilize with liquid seaweed fertilizer or a specialist ‘bulb fertilizer’ in early spring at the first sign of new growth. If you do wish to divide or move these bulbs, wait until the foliage has died back in summer for best results. 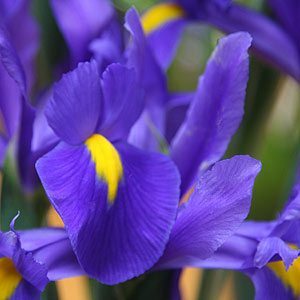 Dutch Iris come in range of colours including the well known blue, violet to purple petal varieties with the trademark yellow splash on each petal. ‘Acapulco’ a deep purple petal. ‘Casablanca’ is a white flowering variety. ‘Purple Sensation’ has a deep purple flower with yellow markings on the falls. ‘Deep River’ which is a lovely royal blue. ‘Texas Gold’ has clean yellow flowers. And the mid blue ‘Paris’. Or you could look for something a little different, ‘Casablanca’ has white petals, the same yellow splash or tongue, but an outstanding Dutch Iris. And then we have ‘Angel Wings’ upright and a real stunner, white and yellow.